"Very friendly and highly professional"
Gary was great at helping me get over my nerves about driving. He is very friendly and highly professional and I would recommend P Drive School of Motoring. "Phoning PDrive was the best thing we did"
"Going out driving with my parents was not enjoyable and made us all very stressed, my mum phoned P Drive and that was the best thing she did!" "You can tell Gary loves teaching." "You can tell Gary loves teaching as his lessons are always enjoyable and he encourages me to read more on my give ways and road rules in-between lessons so that I can put it into practise!" Gary is a great and friendly instructor. These lessons have enabled me to feel confident on the roads with my knowledge and skills developed. Highly recommend Gary! "Good prices, Good teacher, Good service." Good prices, Good teacher, Good service. Probably would have cost me more and taken longer with any other Fleurieu driving instructor. "I had a great experience with Gary!" I had a great experience with Gary! He is an incredibly patient and thorough instructor, I have become a much much much better driver with his help. I would highly recommend to anyone looking for an instructor in the Victor Harbor area! "I highly recommend Gary for teaching you to drive." I highly recommend Gary for teaching you to drive. He has a kind and patient attitude which makes you feel at ease whilst he instructs you with what to do. I did the log book which took some time, but you'll be a much better driver for it and understand everything more clearly. Gary has taught both my sons to drive and he is very thorough and professional. We are all very happy with the outcome. Thanks Gary. "Could not have been happier." We went through Gary for our childrens' driving lessons and could not have been happier. Kids felt relaxed with him and we felt confident in his ability to teach them the skills they needed to not only pass their test but to continue driving with a high level of knowledge and skill. I would totally recommend Gary to teach you how to drive. I was a nervous and anxious person regarding driving but there was something about Gary that has helped me overcome that 😃 I have found him very relaxed and calm and I have learned a lot, even when I was having a bad day he was always positive and said we will try next again next lesson. "Gary provided excellent driving lessons." Gary provided excellent driving lessons and tuition for my wife. I would recommend Gary to anyone wanting to learn to drive. He has a patient demeanor ensuring all learning requirements are met. "Gary was a great instructor." I was never a very confident driver. I was on my Ls for a very long time. Gary was a great instructor and now after many many years of walking everywhere I now have my Ps. "I would strongly recommend him.."
Gary taught me the techniques, rules and most importantly how to be safe on country roads and suburban roads. I would strongly recommend him. "Gary provides a really good professional service." Gary provides a really good professional service that teaches you everything you need to know and sets you on the way for safe and easy driving in the future. Gary has taught both my kids to drive and has proved to be a highly effective instructor. He offers both VORT and CBT&A which gives genuine choice. I thoroughly recommend him. Gary is an excellent driving instructor I have learnt lots of skills that will stay with me for life and would highly recommend having as your driving instuctor. Super patient instructor! Definitely recommend to anyone in the fleurieu area! 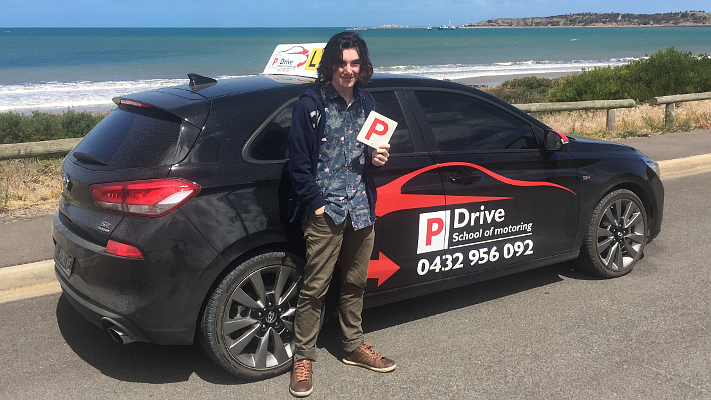 Welcome to P Drive School of Motoring, the only local Driving School on the Fleurieu Peninsula you will need to contact to get your licence. If you’re looking for a professional, friendly, local instructor, who offers great customer service and is passionate about life driving skills, not only to get your licence but to keep you safe out on the roads. Based in Victor Harbor, P Drive was established in 2011 and is owned and operated by local Government Authorised Examiner Gary Eves. Lessons are taken in the 2017 car of the year Hyundai I30 SR.
Click the red links below for details. 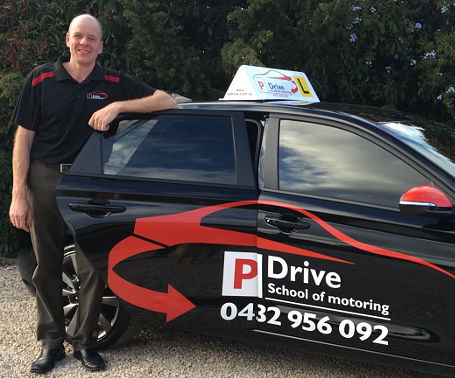 Gary at P Drive School of Motoring is the only local Keys2drive accredited instructor in the Victor Harbor area. So why not take advantage of this free, Government funded lesson? Gary is Authorised by the Government and specialises in the log book Competency Training & Assessment (CBT&A) He can issue a certificate of competency to get your licence when all the tasks have been signed off in the log book. Gary will train you in all the skills to be ready for your Vehicle on Road Test (VORT). Enter your details on the keys2drive website to get your free lesson code and then ring Gary, your keys2drive accredited driving instructor, with the code to book the lesson. Please buy securely online here or contact us directly for other payment methods: 24 hours notice of cancellation is required, or the lesson will be charged at full rate. Free Government Lesson now available!